I only wish there were one right answer. If there were, I would have cards printed that would say, To Capture Motion do the following! Unfortunately there is no magical card with the one answer, just like so many things in photography, it is all situational. There are a few guidelines that I will provide you has a start, but before I do, if you have a chance go back and read my blog post from December 2011, Shooting with Intention. The reason to re-read my prior post is that it is critical that you understand the situation you are in and what you are trying to achieve prior to shooting. Letting the primary object blur while keeping the background in sharp focus. The following two images are of Eneko Llanos and where shot from the back of a moto at the Abu Dhabi Triathlon on March 3, 2012. I had my driver pull up along side Eneko and match his speed. The first shot is at 1/1250th and the second shot is at 1/100th. These images where shot within seconds of each other as you can see by the view of the Persian Gulf from the bridge. The next image, there is some blur to the background, which is mostly noticeable on the vertical elements of the bridge structure and there is a spin on the logo on the wheels. The island in the background still looks fairly sharp due primarily to its distance away from our main subject. The next image was again shot from a moto at 1/100th of Jimmy Johnsen at Challenge Copenhagen. Since the background is much closer you can see how it is blurred. Jimmy Johnsen at 2011 Challenge Copenhagen. I know there are very few of us that get to (or really want to) shoot while sitting backwards on the back of a motorcycle, but the effect is really the same as following the subject as they riding by. The recent technology of Image Stabilized lens are a great help. If you are panning horizontally, the lens will stabilize the vertical movement of your lens. Similarly if you are panning vertically, your horizontal movements will be stabilized. Keep in mind, it image stabilization does nothing to stabilize the subject, it stabilizes the photographer! Next we are going to slow the shutter speed even more, but hold the camera steady. Here are three shots from the Medtronic Twin Cities Marathon, one by me and two by one of my periodic partners in crime, Joe Michl. The shutter speeds are 1/50th, 1/30th and 1/20th respectively. Now that everyone is thinking about slow shutter speeds, it is also possible to convey the idea of motion by using a high shutter speed (1/1000th). The first image is again from the Medtronic Twin Cities Marathon and showing the lead pack of runners early in the race. Not only are their feet off of the ground, but the splashing of the water at the aid station, can only occur when there is motion. The next image is from the 2012 Minnesota High School Section Ski Championship. Again the image is razor sharp (1/1600th) but slalom gate is bent over and the snow is kicking up under her skis, which can only happen at speed. Finally, now matter what your shutter speed, if you manage to get a shot of The Flash, you immediately know there is motion! Shoot with intention, practice and go out and have some fun, remember the photons are free! To paraphrase, Ansel Adams – A great photograph is knowing where to stand. To steal a bit from the immortal landscape photographer, If you want to take a great triathlon photo, go stand in Abu Dhabi! Having just returned from The Abu Dhabi International Triathlon, I was able to find a few great places to stand! I am truly fortunate to be working in a sport that is exciting, growing and is made up of some of the greatest people that I have ever met. It feels like a community, no matter where you go. The triathlete population has high expectations of themselves and their equipment. This is a group that travels to races both in the US and Internationally. The race promoters and organizers also have high expectations of themselves and are continually striving to provide each athlete and their often accompanying family members and support group a great race and social experience. 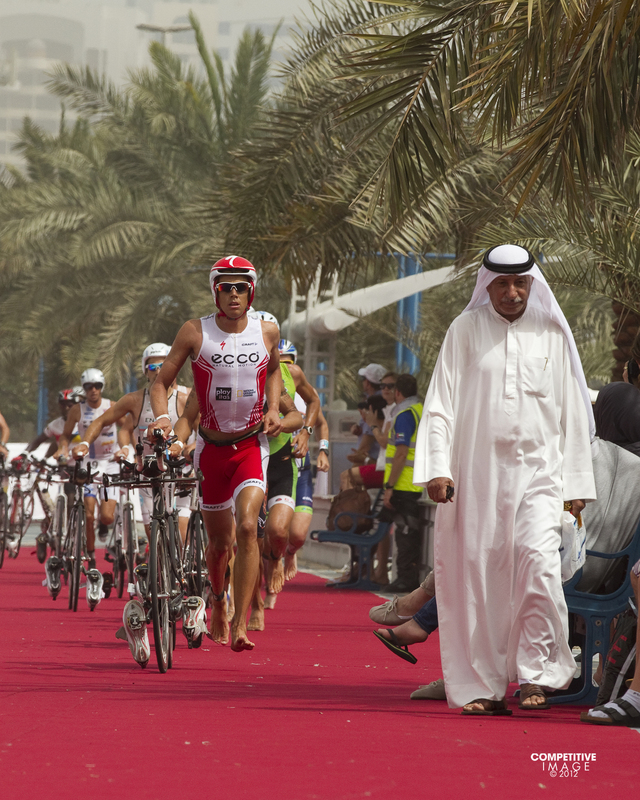 From the inception of the Abu Dhabi International Triathlon in 2010, resources were made available to put on a first class race, without exception. Their goal was not only to have an outstanding professional field, but also to have a similar professional experience for the age group athletes, which has now grown to over 1,800 athletes. Where else in the world can you swim within sight of a Palace, race through the desert and then around a Formula 1 Track? This was my second visit to Abu Dhabi and this year I was shooting primarily on behalf of 220 Triathlon Magazine in the UK. My images will also appear in Tri-Magazine.net; Australian Triathlete Magazine, Triathlon Magazine Canada and Triathlete Asia. This blog post is image heavy and light on technique, but I hope you enjoy it. It is truly an interesting and exciting place to shoot. There are also unusual challenges, depending on the wind, you can have crystal clear blue skies or extremely flat bright light with the air filled with sand coming off of the Arabian Desert. While some magical infinitely variable split neutral density filter would have been nice, I did rely on Lightroom to clean up images. Aussie Clayton Fettle leads out of the water. Brit Jodie Swallow, former 70.3 World Champion and now a member of Team Abu Dhabi, rides by the mosaic of Sheikh Khalifa, the current President of the U.A.E. Ultimate victor, Rasmus Henning and the chase group on the Yas Marina F-1 Track. A great surprise to see friend Peter Hurley, President of Quintana Roo finishing up his short course race. After two very difficult seasons it was great to see Rasmus Henning take the win in the final kilometer. From the speed of the F-1 track to the blowing sands of the Arabian Desert. I did manage to fit in a bit of touring here at the spectacular Sheikh Zayed Grand Mosque. View of the Abu Dhabi skyline. Media visit to the Abu Dhabi Falcon Hospital. I got to participate in serving lunch. Many thanks to Thierry Sourbier for the photo! As expected, it was a great race and a great trip. My calendar is already marked for 2013! Look for my next post later this week – Capturing Motion!